I’ve been thinking a lot about this lately. Recently, I’ve seen several posts from teacher authors pushing back on the idea that they should offer more of their resources and ideas for free. Many teachers feel that as a teaching community there should be open sharing among colleagues. They are disappointed when something that they think might be helpful to them has to be had at a cost. For me, I think there will always be a tension between my desire to be the teacher next door and the teacherpreneur. I try to answer as many emails as I can. I help teachers where I can. I’ve given away more things than I can count. I have tons of freebies in my store. I have an online Facebook group where teachers can chat about a lot of the things I blog about, or bring up things they need help with. I have even helped mentor someone through National Boards who I’ve never met…just know through blogging. I feel like in my last four years of blogging, I’ve tried to create that community. I *think* teachers that follow me closely know that I try to make myself as available as I can. Then there’s the teacherpreneur side. The side that wants…expects…to be compensated for the thousands of hours a year I work in addition to being a full time teacher in an elementary classroom. The money I spend on clip arts, borders, fonts…it’s quite a bit. Often my free items include these paid resources…because it makes the freebies nicer. I don’t want teachers to use junky stuff. I share what I use in my own room. I blog often. I communicate ideas on social media too. All of this takes time. Who can properly quantify how much someone’s time is worth? So, many bloggers over the years have given away a lot. Probably more than we should, because we want to help. None of us came into this thinking that we were going to be selling anything. Now we’re learning how to run a business. And we’re asking you to stop seeing us as the teacher next door…we’re saying…we need you to see us as a business. We know that you used to just stop by our blogs and download a bunch of freebies to put together a unit. Now we’re saying…could you pay for an even better compilation of similar resources? For some people it seems like a bait and switch. It seems like we’re changing the rules in the middle of the game. You know what, we kind of are. Because it doesn’t make any sense to keep devaluing ourselves. One of the things I’m learning about myself and this practice…is that we as teachers often devalue ourselves. We say things like…well, I am not good at math, I only teach first grade…or…I’m only a teacher. There are always those teachers who sit around at meetings with open hands expecting someone to put something in it when the time comes for fresh ideas. Everyone is busy, but we all know those teachers who go above and beyond. Maybe you are reading this and you are that teacher for your team. Constantly giving ideas, providing feedback, coming to the table with something. After a while, whether you get paid for it or not…it gets old. Getting paid for it takes away some of the sting, but no one likes to feel used. 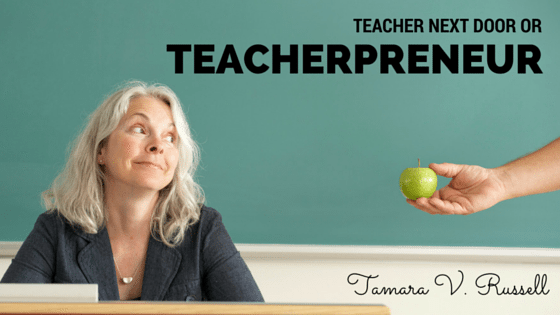 Not the teacher next door part of me…and most definitely not the teacherpreneur side. I very rarely get negative feedback. I really think I have some of the most appreciative teachers that follow me. I am so thankful for the community that we’ve built together. Thanks for growing with me as I grow. Thanks for always cheering on my next project and thanking me for it…whether you had to pay for it or not.